Scythe sends out word that its Mugen 4 processor cooler will be available on the market as of this week for 36EUR (excl. VAT). 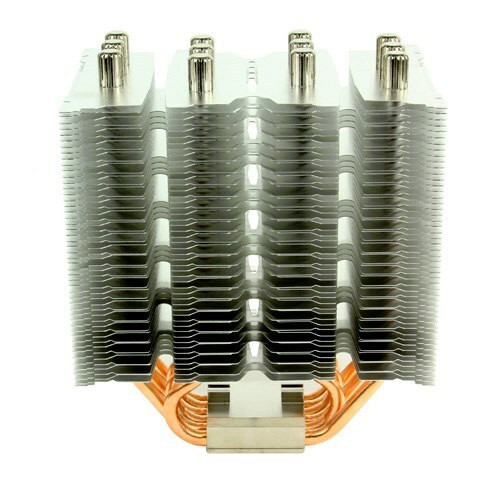 The new tower model features a copper base, six copper heatpipes and a T-M.A.P.S. (Three-dimensional Multiple Airflow Pass- through Structure) aluminium fin structure. The heatsink measures 130mm x 88mm x 156.45mm and weighs 625g. Airflow is provided by the GlideStream 120 PWM, this sleeve bearing PWM fan delivers 20.7-79CFM at a noise level of 5.3-28dBA. Scythe engineers improved the Mugen 3 design with special focus on more compact heatsink dimensions combined with better performance, in order to elevate the Mugen to the next level. Outcome is a high-end CPU cooler with the compact dimensions of 130 x 88 x 156,45 mm (W x H x D) and the weight of 625 grams, allowing the Mugen 4 to be installed in virtually every computer. 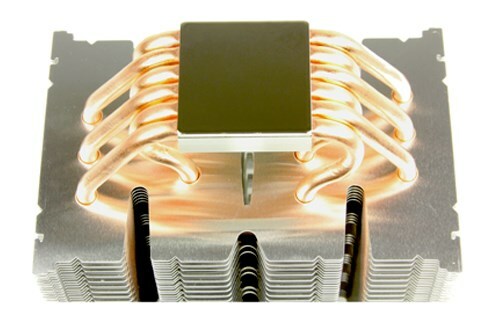 Although the heatsink size and weight have been reduced, the performance could be further boosted compared to the predecessor. This was achieved thanks to the newly developed T-M.A.P.S. (Three-dimensional Multiple Airflow Pass-Through Structure) fin structure, which increases the airflow inside the cooling heatsink, allowing immensely improved performance. In the process of improving the performance, Scythe Glide Stream case fan series played an important role. 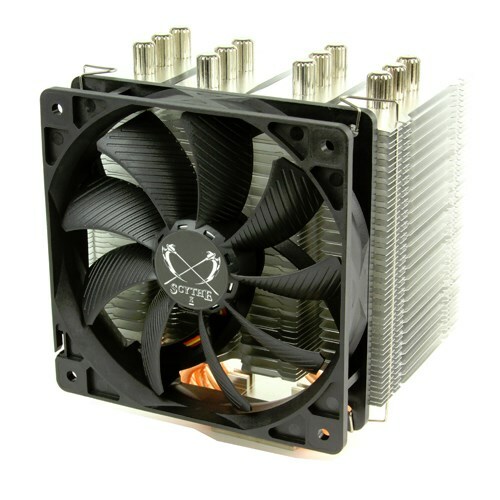 Supplied 120 mm model is supporting the PWM standard, allowing the fan speed to be adjusted individually according to the CPU temperature by the motherboard. Thanks to this, a very wide fan speed range from 400 to 1.400 RPM with airflow between 20,7 and 79 CFM (35,16 to 134,2 m³/h) can be utilized. Low noise level between 5,3 and 28,0 dBA make the Glide Stream case fan even more suited for the new Mugen 4, allowing it to be more even more silent than the predecessor. Users, seeking even higher performance are able to use the second fan clip set, which is supplied, to attach a second fan and create a "push-pull" configuration. Feedback from users and media has been utilized, when improving the mounting mechanism. Mugen 4 is first to come with the newly developed ?Hyper Precision Mounting System" (H.P.M.S.). Hence makes the mounting procedure much easier and faster than before. Compatibility to the AMD sockets AM2, AM2+, AM3, AM3+, FM1 and FM2 as well as the Intel sockets LGA 775, 1155, 1156, 1366, 2011 is assured. In addition, new socket LGA 1150 (Intel "Haswell") is fully supported. All required mounting clips and screws are supplied with the Scythe Mugen 4, including one wrench, a multi-lingual manual and quality thermal grease.